In between my husband’s bouts of artisan bread baking, we sometimes get a craving for fresh yeasted bread without the long wait or fuss. The original no-knead bread from the New York Times recipe (shown above) eliminates the latter, but you still have to plan 18-24 hours in advance before flinging your dough into a red-hot Dutch oven, and the length of room-temperature fermentation makes the finished product almost taste like beer bread to me. The recipe is so simple that I make it on evenings when I know I’m going to want bread the next day, but am too tired even to bother looking up a recipe. The dough above, on the other hand, I make in the afternoon when I haven’t planned ahead, need some fresh bread within a few hours, and am too busy dealing with other household chores to spend time kneading, resting, punching, shaping, and resting some more. One super-sized batch of dough takes just a minute or two to mix up, then I throw the container in the corner and ignore it for two hours. 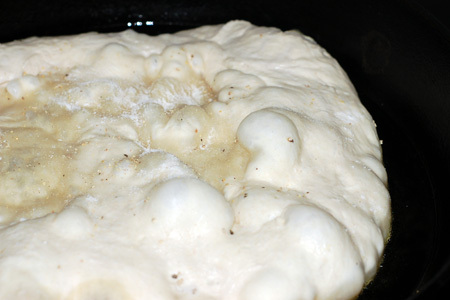 The resulting mountain of bubbly dough is ready to bake immediately, and focaccia can come out of the oven in half an hour. 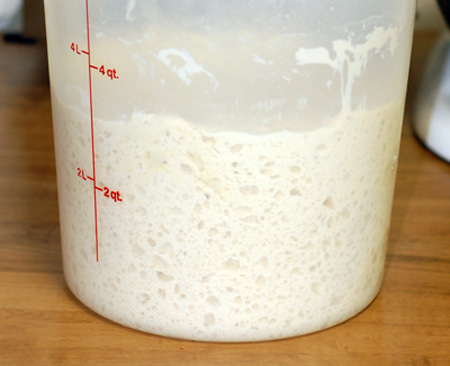 The rest of the dough (3 more loaves’ worth) can be stored in the refrigerator for nearly two weeks, ready at a moment’s notice the next time you have a hankering. 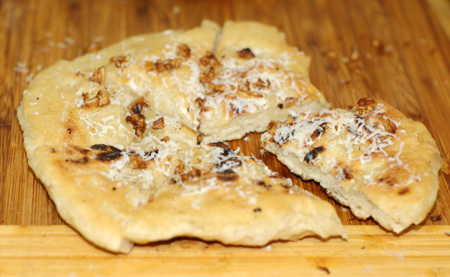 I’ve used this recipe to make both pizza and Parmesan-dusted loaves of focaccia in the past. More recently, I threw blobs of the dough into a hot frying pan to make fresh croutons when my oven was otherwise occupied. The resulting nuggets were so pillowy inside and crisp outside that we couldn’t stop eating them, with or without the salad, and I started hatching a crazy idea to cook a whole loaf of focaccia the same way. The next day, I pulled out a fistful of dough, shaped it into an 8-inch round and started heating up my cast iron skillet with some olive oil while it rested for 20 minutes. I had some reservations about the stickiness of the dough, and let my round rest on a dinner plate, thinking I could upend it easily into the skillet that way; fussing with it a few minutes later, I decided that it was going to stick too much to the plate and put a sheet of waxed paper underneath it. When the skillet was hot and my oil infused with garlicky goodness, I flipped the plate onto the skillet and tried to peel the waxed paper back from the dough as it started to cook. No dice. I lost a big chunk of dough to the paper and had a few moments where I thought we were just going to have to eat waxed-paper focaccia. By this time, the underside of the dough was not only cooked, but starting to blacken. Frantically, I turned down the heat and flipped the bread, already contemplating whether or not I should just ditch the whole idea and pretend it never happened. I saw the monstrosity through, deciding my husband would be appalled at the proposition of wasted bread dough and pulling out a second fistful of dough to try again. This time, I hastily spread the cold dough into a round right on the counter. When the misshapen frisbee was cooked through, I added a splash of oil to the skillet, picked up the new round of dough with my fingers, and regardless of its temperature or restedness, plopped it in. By this time, the skillet was a little on the cool side and I thought the loaf would just be a grease sponge. I got the temperature back to a more moderate setting, and the bread ultimately came out very slightly charred, topped with Pecorino romano cheese and some minced roasted garlic. We actually ended up eating even the problematic first loaf—blackened though it was—with no complaint, so it was a good thing I didn’t trash it. Once I got the temperature right, this method actually produced fantastic bread in a very short amount of time, and without turning on my oven, a bonus now that the weather is finally edging toward summer here. 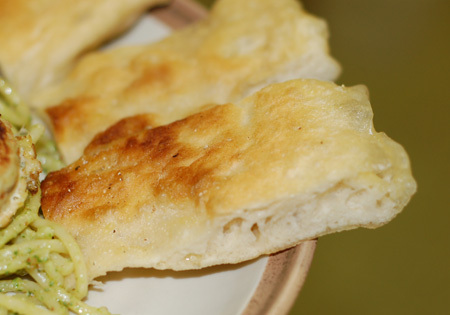 Actually, it reminds me a lot of grilled flatbread or pizza baked on a super-heated oven stone, with bits of char and a very crisp exterior; we found its texture preferable to the standard oven-baked focaccia bread. 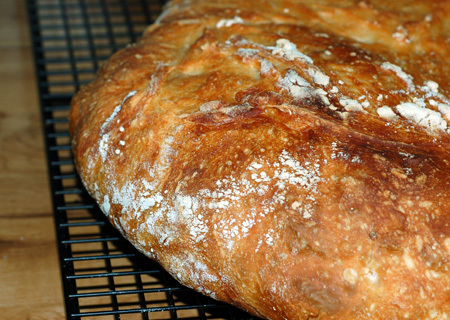 Source: Artisan Bread in 5 Minutes a Day . Pull a grapefruit-sized hunk of dough out of the container in the fridge. It will be rather sticky to handle, so use sprinkles of bench flour on your hands and the counter to keep it from clinging too much. 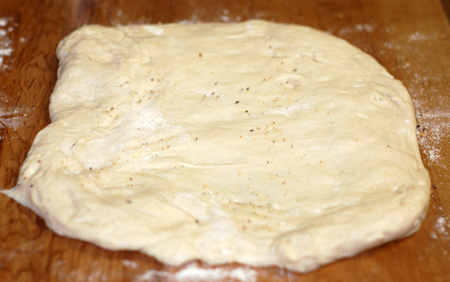 Pull, flatten, or roll the dough out into an 9-inch round and sprinkle both sides generously with salt and pepper. Leave to rest on the counter (sprinkle just enough flour underneath to keep it from sticking, or do this on a small silpat) while your skillet warms up. Heat up the oil in a 10-inch cast iron or heavy enameled skillet over medium-low heat; there should be enough to coat the sides and bottom of the skillet 1/8″ or less deep. Crush the garlic cloves and remove their skins; add to the heating oil and cook on both sides until nicely golden brown but not burned. Remove the garlic (you can reserve it to mince and top the finished bread if you like). 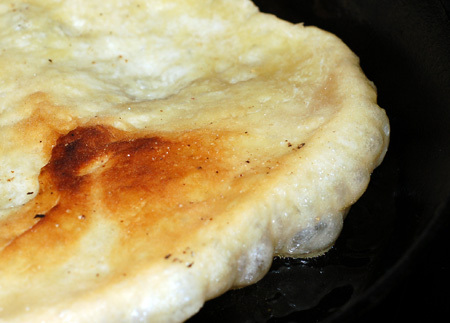 Gently pick up the round of dough and center it in the hot skillet. Cook over medium-low to medium heat for about 3-5 minutes per side, until the bread is cooked through, with a golden brown crust on both sides. It will take some practice to get your skillet heated to the right level, so that the bread cooks quickly without burning, but fortunately even the scorched focaccia tastes pretty amazing. Remove from the skillet, grate some cheese over it if desired, and allow to cool for several minutes before cutting into it. I like the looks of this. Will have to give it a try! This sounds fabulous! I am going to try it. Michelle, let me know how it goes!